Diisonance is a collaboration, part of a jigsaw, the genesis of which is shared experiences; Steve and paul met in the early nineties squatting in Claremont Road, east London at the height of anti-road protests, poll-tax riots and dissent. They’ve tried to piece together the past from the future, making sense of the ghosts that stay with them and the trust they offer one another helps clarify the feelings of confusion and love for their entwined topics; faltering, broken and rebuilt many times over. paul has written extensively on his experiences of squatting/protesting against the building of the M11 Link Road through east London, most recently in Place Waste Dissent (Influx Press 2015), which ‘plots the run-off, rackets and 90’s resistance to the proposed M11 Link Road; text experiments and collage from Claremont Road to Cameron. Memory traces re-surface the A12’ which features Steve’s photography. In Diisonance Steve’s starting point is a 21st century response to the collage/text of Place Waste Dissent and/or/with further memory travels. paul tries to look to the future in responding to Steve’s response to paul’s response(s), peacing the past from the future. 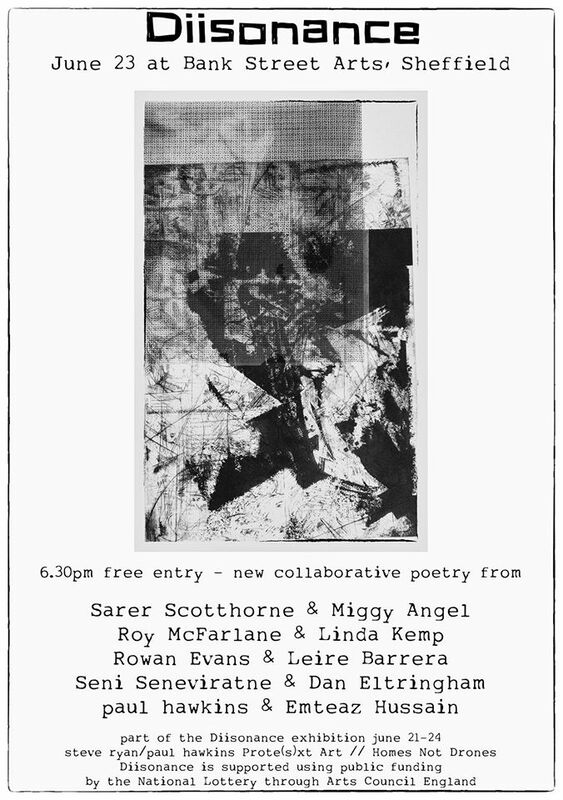 paul hawkins & Rowan Evans are running a Creating Experimental & Collaborative Poetry on Friday June 23 2.00pm – 4.30pm. The cost is £5.00 per person. Enquiries and booking: hesterglock@gmail.com. All participants will be invited to read any new work created in the evening, joining some specially commissioned performances. Ten poets have been collaborating in pairs to produce new poetry to perform this evening. Their only guide is that they start from the word Dissonance, and that their performance be no longer than six minutes. This event is free, and begins at 6.30pm. All new Dissonance work will be published by Hesterglock Press in a book to mark the exhibition and events. Driven forward by scary monsters, haunted by the notion of chaos, London artist Steve Ryan’s work tries to pin down the slippery essence of ’the stuff’. Peripatetic by design, he’s recently experienced the joy of being tethered which has grounded him long enough to start production of a project over 30 years in the making, and with a bit of luck it will be finished in a little less time, but probably not. paul hawkins is a bristol-based poet, text artist & word-processor. paul studied the art of sleeping standing up and drinking lying down with nearly disastrous consequences. He’s the author of Claremont Road, Contumacy (both Erbacce Press) & Place Waste Dissent (Influx Press 2015). he collaborates with Portugese text artist/poet bruno neiva, co-authoring Servant Drone (KF&S Press 2015) and The Secret of Good Posture (Team Trident Press 2016). At the last count paul has moved on average every 11 months, but only ever owned one tent. Collages of text/art from Place Waste Dissent were exhibited at Bank Street Arts in 2016. paul co-runs Hesterglock Press and is a Spike Associate.